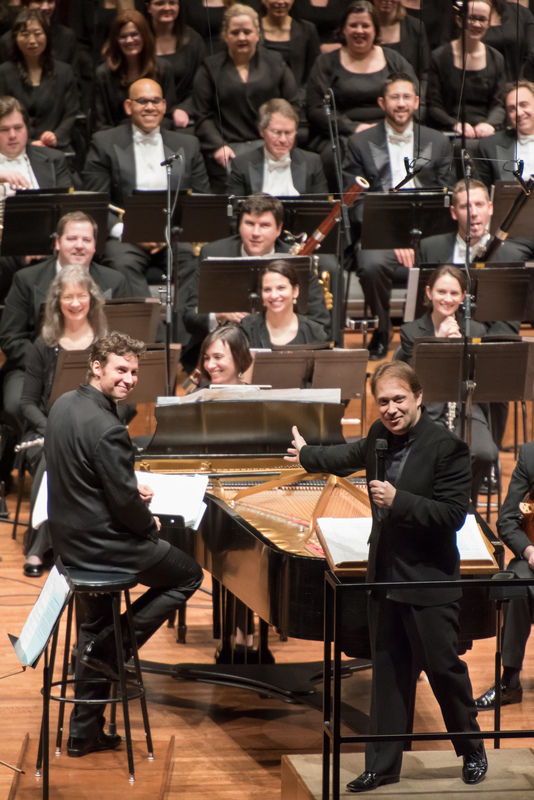 The last time Ludovic Morlot led the Seattle Symphony in a Charles Ives symphony (the Second), he paired it with Rachmaninoff’s Third Piano Concerto (and got pulses running with the Overture to Leonard Bernstein’s musical Candide as a curtain raiser). I can’t say I get the connections he apparently sees between the conservative Russian and his maverick American contemporary. Maybe the idea is to add still another layer of meta-contrast on top of the already explosively varied mixtures that comprise Ives’ sound world. In any case, this week’s program brings another Rach-Ives pairing. It was heartening to encounter such an unpredictable interpretation of Rach 3 in last night’s performance (I believe the third time in as many years that Morlot has conducted the work here). Though the previous Rachmaninoff-meets-Ives effort (back in June 2012) had featured the ever-fascinating Stephen Hough as the soloist, the Third Piano Concerto sounded a bit undercooked, the rapport between pianist and orchestra undeveloped. 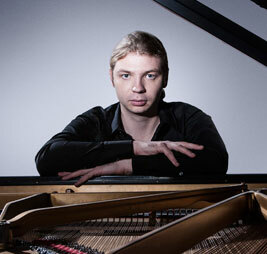 Some unusual angles were explored by the young Russian pianist Denis Kozhukhin. One of the Mighty Four pianists who took part in the complete Rachmaninoff piano concerto cycle at Benaroya two years ago in January (playing the Fourth Concerto), Kozhukhin has a straightforward, unexaggerated presence at the keyboard, concentrating his (and our) attention solely on the music. What particularly stood out in approach were the glistening, spun-silk textures in the Intermezzo and above all in the final movement. Kozhukhin executed these with such flawless grace I wished the massive chordal climax in the first movement — which was underpowered and lacked profile — had set up an even starker contrast to his gravity-defying elegance. Along with nuanced phrasing of the most lyrical moments, Kozhukhin showed a penchant for the giddier flights in Rachmaninoff’s writing. This reached a state of outright exuberance (ultimately downplaying the composer’s luxuriant moodiness) in the culmination of the finale, where a magnificent rallying of forces between the piano and orchestra joyfully reforges the theme that opens the Concerto. In fact, for all the Mahlerian comparison that might be made with Ives, the latter’s Fourth Symphony is quite modest in duration (its length comparable to that of a Classical symphony). But its blend of familiar (even “homey”) elements with the most audacious complexities immediately forces the listener out of easy-going habits. And that gives it an enormous resonance, a field of implications, that may seem disproportionate to the dimensions of the composer’s architecture. Yet it all results in a thrilling rush — and a reset/reboot to your thinking about what music can do. As he has shown with other musical pioneers like Edgard Varèse, Morlot has an impressive grasp on just that essential point. He knows that behind the show biz factor of all the paraphernalia, the bells and whistles, this is composing at its most ambitious — thinking in music the way writers, philosophers, scientists think with their respective tools. That dialectic of simplicity-complexity informed Morlot’s own overall vision of the Fourth. Instead of presenting a mere jumble of jarring contrasts, he clearly elicited the sense of enigma that is posed in the brief, preludial opening movement — the enigma that is the engine of this work and that successive movements try to “answer.” The simple hymn tune sung by the chorus in the first movement (“Watchman, tell us of the night”) signals a pilgrimage for meaning. 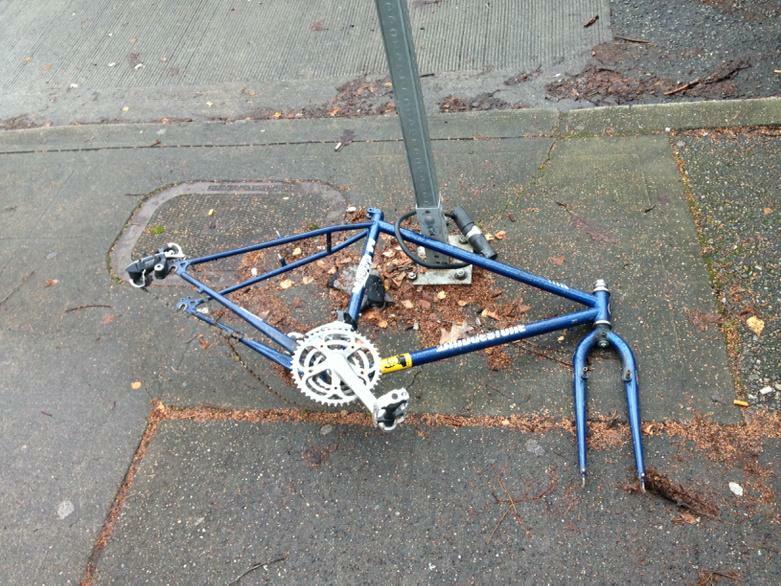 But that pilgrimage soon goes astray — or wanders off into directions unforeseen and unforeseeable. As he molded the music’s progress, at times I noticed Morlot using conducting gestures I’ve never seen him make before. In Morlot’s interpretation, “the searching question” that we “ask of life” (as the composer described his “program”) has to take account of all of it: the mystical meditations of the otherworldly (and offstage) strings and harps, the bright noon of chaotically colliding marches and cheerful anarchy in the second movement (Ives’ “Comedy”), the sober, ordered fugue of the third (more wonderful string ensemble playing here), and the cosmic rhythms that set the finale in motion. 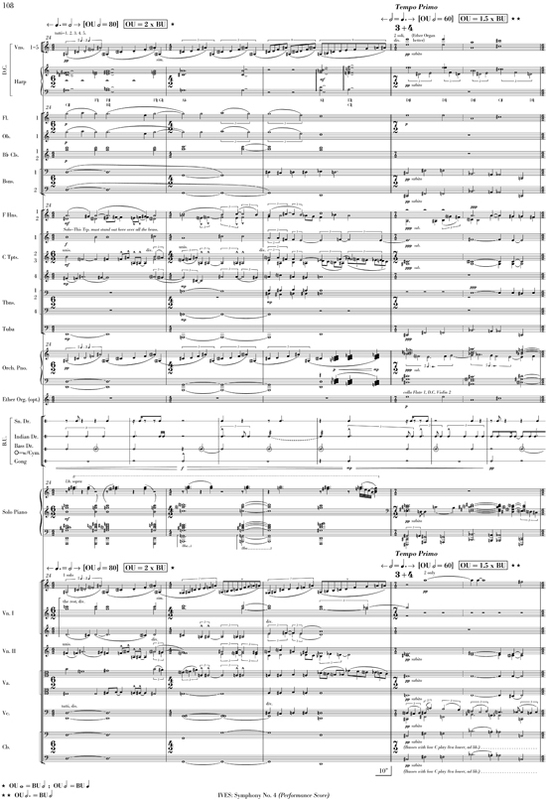 Ives may have intended the more conventional beauty of the “religious” answer offered by the third movement to be heard as parody (perhaps like Strauss in the parallel section of Also Sprach Zarathustra?) — much as the “Comedy” of the second affectionately parodies secular, civic life. Morlot allowed all of these attempts to get at “the searching question” to have their say, as if each represents the answer at the moment it holds the stage. The outsize, raucous, yawping vitality of the second movement was overwhelming, a forerunner of the spell of sonic ecstasy-from-noise that later technology would allow rock and other popular genres to exploit. It’s typical for Ives to represent this most exalted moment of spiritual search in ever more dissonant and blaring sound…. This to me has always suggested the Mount Sinai aspect of spiritual revelation. Man searches and searches, [but] as he gets too close to the divine it is more than he can bear, the sounds and the harmonies are just too much…. We have to turn away and a few little tendrils of singed nerve endings then lead to the beginnings of the long, luminous coda. Morlot and the SSO are recording these performances for eventual release as part of their complete cycle of Charles Ives symphonies on the in-house label. Inevitably there will be details that come across with more refinement on the recording than they do in the concert hall. But there’s no substitute for the live experience — above all in a work so reliant on an acoustically spatial concept of symphonic abundance. To have both to compare is ideal. Angelenos have lot to look forward to in coming weeks — including the belated West Coast premiere of Unsuk Chin’s Alice in Wonderland by the LA Philharmonic (in a co-production with LA Opera). I’m more and more in love with this work. The visions of my dreams are for me a much more existential level of experience than anything that I have known in my everyday life. They influence my personality and are the great joy of my life. Dreams are for me an encounter with another world, in which completely different physical laws prevail. Sometimes a dream is so complex that as soon as you wake up only a vague memory of it remains … When you try to describe such a complex dream-state in words, there inevitably arises what we call nonsense, since our language is subjected to a completely different logic. It seems — at least as of now — that tonight’s opening of the Met’s double bill of Tchaikovsky and Bartók will proceed as planned, despite the blizzard arriving. It’s a new production directed by Mariusz Trelinski and starring Anna Netrebko as the blind Princess Iolanta for the Tchaikovsky one-act. Only two decades separate the composition of Iolanta and Bluebeard’s Castle. Yet during these years, the music of fin-de-siècle Romanticism sounded the last gasps of a philosophy that was rapidly being made obsolete by the efforts of a diverse generation of radical younger composers. That, at least, is the narrative we’re usually told. In fact the shift toward modernism was not nearly so clean-cut or abrupt. “When your heart beats irregularly from heart disease, it does so in some predictable patterns. We think we hear some of those same patterns in his music,”says Professor of Internal Medicine Joel Howell about Beethoven, referring to findings in an article he recently co-authored: “The Heartfelt Music of Ludwig van Beethoven” (together with cardiologist Zachary D. Goldberger and musicologist Steven Whiting. [The] authors note that “heavy of heart” could mean sadness but may also describe the sensation of pressure, a feeling that is associated with cardiac disease. “The arrhythmic quality of this section is unquestionable,” they write. I wonder, though, whether their premise might be working the wrong way. Scientists and artists approach unpredictability and patterns in a radically different way. Musical genius deliberately expresses itself via unpredictable patterns. One of the key factors that makes mediocre music mediocre and boring is precisely because (usually unconsciously) we can tell “where it’s going” as it repeats the same formulas over and over. But to the extent that this study is trying to “explain” pattern aberrations, I think it may be on the wrong track. On the other hand, there are plausible arguments for a composer like Mahler — who we know did suffer from a serious heart ailment — inscribing his bio-rhythms into something like the halting rhythmic patterns at the start of his Ninth Symphony. January 21, 2015 • 9:07 am Comments Off on To Moscow, Moscow, Moscow! About 10-15 years ago, it seemed one of the big trends around Chekhov productions was to ratchet up the comedy. All that tristesse and Russian pathos had become so clichéd that directors tried to outdo one another in getting audiences to laugh — too often by hard-hitting with effects that were more vulgar sit-com-y than Chekhovian non-sequitur (Kulygin’s “nonsense”). For me, the two characters who most successfully establish real Chekhovian ambiguity in John Langs’s thoughtful production (using Carol Rocamora’s translation) — though the director relies a bit too much on leitmotivic tics that turn characters into caricatures — are CT Doescher’s poignantly resigned but cheerful Tusenbach and the intelligent, suave, but gently bitter Vershinin of David Quicksall. Julie Briskman comes closest to getting the Chekhov chiaroscuro as the oldest sister, Olga. Her mood swings feel more integrated and organic, whereas they come across as merely “quirky” in several other characters’ portrayals. Alexandra Tavares’ Masha is especially compelling in her “stolen moment” of brief happiness with Vershinin. Sydney Andrews conveys the woozy longing of Irina as a young woman on the cusp of adulthood in the first act; her later development still seems to be a work in progress. John Abramson’s captures the proto-Uncle Vanyan angst of their brother Andrey Sergeevich as he tries to put up a bold front in the face of his crushing disappointments. Hannah Victoria Franklin plays up Natalya’s bossy boorishness and her independent streak, but the class resentment that fuels her seems lost in translation. Recently seen doing good work in New City Theater’s Hamlet, Brandon J. Simmons takes a more straightforwardly comic approach as Kulyigin but gives his pomposity an awkward edge that pays off well in his final scene with Masha. Langs is particularly good at organizing this talented cast in the larger ensemble scenes; he’s not able to solve the complex issues of Chekhov’s tempo and pacing from these to intimate encounters — but this will probably improve as the production matures. He neatly frames the play with marching scenes featuring the army arriving at and then departing from the provincial garrison town where the Prozorov family languishes. They stomp in to the beating of a big bass drum, automatons ready for the call of duty; but at they end we see them marching in silent slow motion far upstage — and can imagine them heading straight for the trenches of the First World War. Among the delights of this production are the design elements: Jennifer Zeyl’s birch-framed set with tricky Chekhovian seasonal changes beautifully established by Robert J. Aguilar’s lighting. 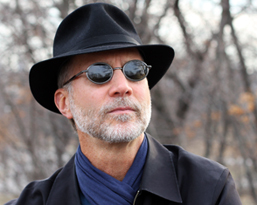 Robertson Witmer’s soundscape brings out the full range of Chekhov’s “score” — in this play whose subtexts include a major role for sounds: the forest echoes, a flock of birds passing, the wind, the magic of the spinning top given as a gift to Irina by the aging army doctor Chebutykin (such a powerful symbol of frenzied but futile action). 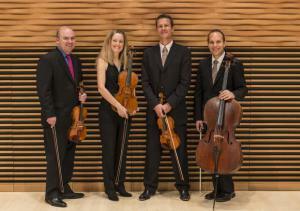 Tonight the SLSQ gives the world premiere of John Adams’s Second String Quartet at Stanford. “It’s a great time both to be playing in a string quartet and to be writing string quartets,” remarks Geoff Nuttall, first violinist and cofounder of the St. Lawrence String Quartet (SLSQ). 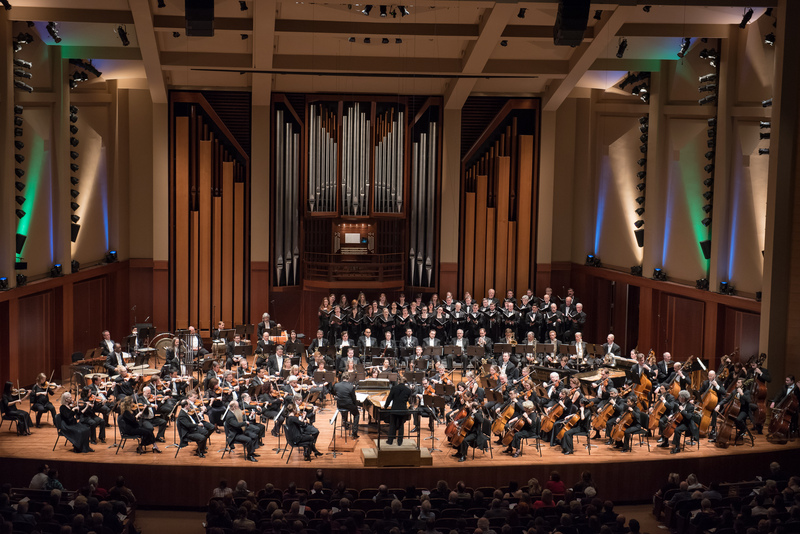 He’s thrilled about how both pursuits—those of the recreative performing artist and of the composer who creates from scratch—will be fused in three distinctive ways during the course of the SLSQ’s upcoming season at Bing Concert Hall. A warning in the lobby for OPERA San Antonio’s recent new production of Salome by Richard Strauss. Directed by Candace Evans, it starred Patricia Racette in her stage role debut. Steven Pinker has published a thought-provoking essay titled “Shakespeare: One of the First and Greatest Psychologists”. Isabella compares the administration of an idealized divine justice with the all-too-fallible human justice. She reminds us that humans are capable of meting out patently cruel and pointless punishment judgments with complete confidence they are doing the right thing. A recurring discovery of social and cognitive psychology is that human beings are absurdly overconfident in their own knowledge, wisdom, and rectitude. Everyone thinks that he or she is in the right, and that the people they disagree with are stupid, stubborn, and ignorant. People reliably overestimate their own knowledge, and misjudge their own accuracy at making predictions. A common theme of both Shakespeare and modern social psychology is the human species’ overconfidence. These two perspectives — that of the perpetrator or scientist, and that of the victim or moralist — color every analysis of human behavior. And here, we see Shakespeare suddenly flipping from one to the other for dramatic effect.